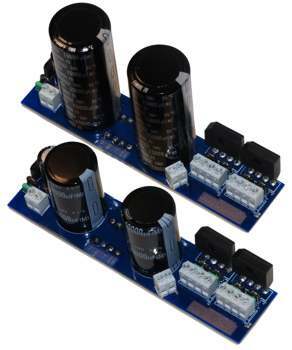 Predator 2 PSU is a complete power supply module developed especially for 2 channels ZapPulse 2.3SE Class D amplifiers. The module contains both the normal +/-60V DC supply and also the external Gate Driver supply, which enables you to reduce heat emission from the amplifier to an absolute minimum. If you do not use the external Gate Driver supply, the ZapPulse modules will generate a Gate Drive voltage from the -60V rail. However this is obviously at expense of some power loss. Around 6 Watts per ZapPulse module. This heat loss can be almost completely avoided by using the Gate Drive supply of the Predator 2 power unit. However is does require the mains transformer to have a 15 V AC winding for this purpose. All our ZapPulse transformers have this winding, but if you use another transformer, you can still use the Gate Drive option, simply by connecting a loose 15 V AC 1 Ampere / 15 VA transformer. 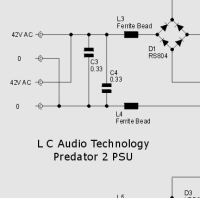 The original Predator supply had 2 x 10.000 uF capacitance at 63 Volts. 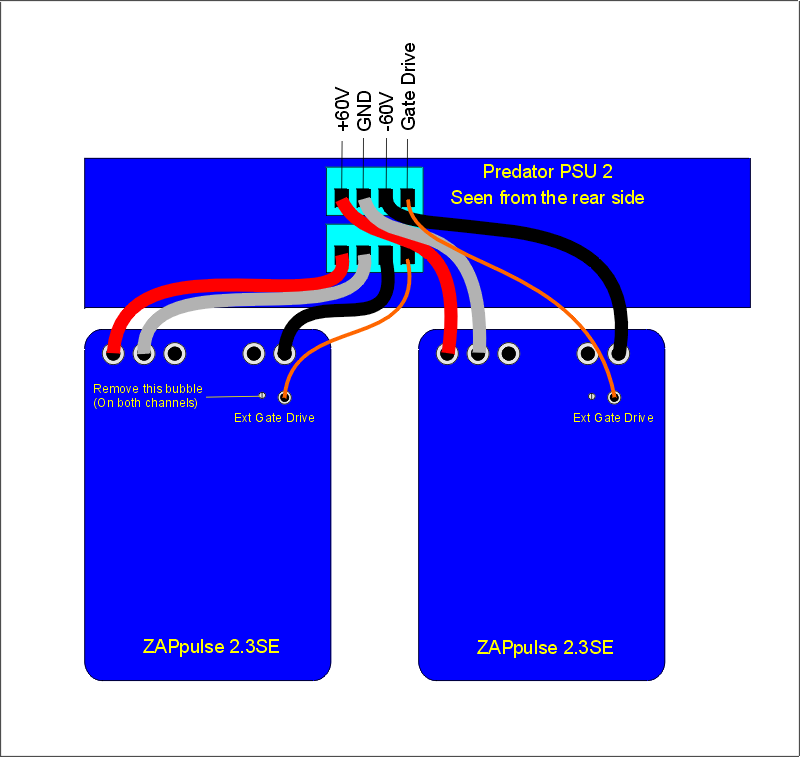 But the ZapPulse 2.3SE is spec'ed up to +/- 80V DC, so the new supply modules are equipped with 2 x 15.000 uF capacitors at 80 V. This makes it possible to build a 2 x 350 Watts in 8 Ohms / 2 x 700 Watts in 4 Ohms amplifier. Click to enlarge Image! The connection is very simple. Connect + to +, - to -, GND to GND and Gate Drive to Gate Drive. Remember to remove the bubble 'Int GD' on the ZapPulse modules as shown. So they will not generate their own Gate Drive also. We recommend using short wires for best sound quality! Click to enlarge Image! Transformer connection. Most modern transformers follow the shown colour coding standard. Yellow, Orange, Red and Black. Connect these wires in order from light to dark colour, or the other way around. Doesn't matter. 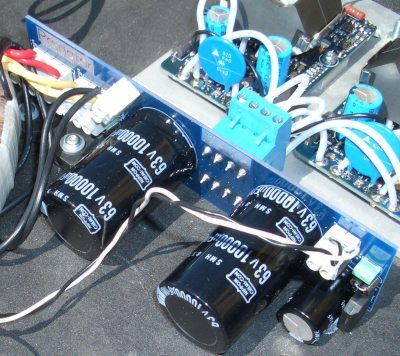 If you are going to connect 2 transformers to the PSU remember that each transformer should be paralleled with itself (NOT the other transformer!!). In that case simply connect in the same order, the wires in each 4 pole terminal of the Predator PSU. 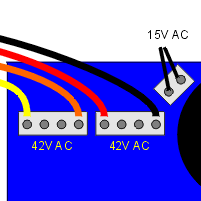 15V AC for Gate Drive should be connected to the 2 pole tilted terminal. Click to enlarge Image! The schematic is very straight forward. But note the special coupling with 2 main rectifiers. 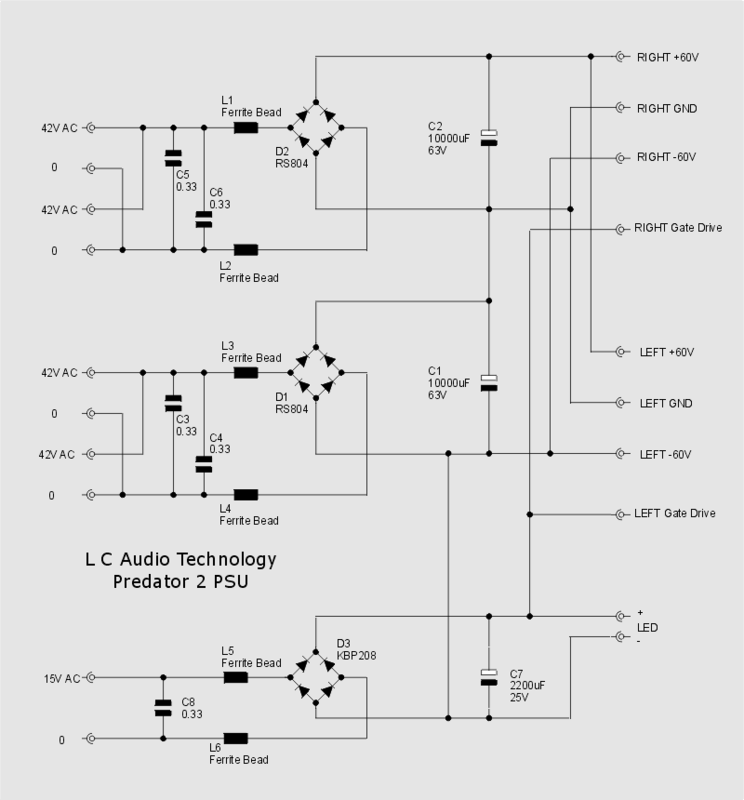 This principle was originally introduced by L C Audio in the 'Super POwer Supply' more than 10 years ago. 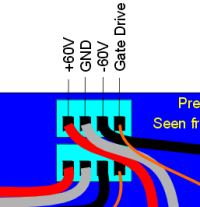 The smart thing of this approach is that no charging currents go through the GND point. This way noise and hum is eliminated in the ground plane. There is a special terminal to connect an LED. Remember to use a series resistor. Depending on the LED use 2k2 to 10k. Predator 10000uF in ZapPulse 2.3SE application. Click for larger picture! Page Build Completed in: 0.019 seconds. .